As a mom with a full time job, my nights with my son are limited to maybe a good 2 full hours of my full attention, so I try to make good use of it. Of course with that comes the responsibility of feeding my little guy good food. While the image above is not mine, it came close to what I could find online to the recipe I'm going to provide below. I need to work on my food photography skills! I enjoy cooking, but last year I think I got a little lazy and I wasn't cooking as often. One of my resolutions was to cook at least 5 meals a week. So Sunday through Thursday. I like to leave Friday and Saturday open for a pizza night, leftovers or dinner out. I actually made this pork recipe this week and both my son and husband loved it. Feeding a 2 year can be challenging but I was so happy he ate his whole meal without a fuss. He even asked for more. That's gotta be a sign that it was good. So I hope you enjoy the recipe with your family. Email me or message if you'd like to see other recipe ideas. I've devoted to post at least once a week to get the ball rolling. Keep half for later and the other half in a ziploc bag with your pork. You can marinade the pork the night before or a few hours before cooking. Heat 2 tbsp. of olive oil in a large skillet over medium-high heat. Place pork in pan; cook 2-3 minutes on each side. If you decide to cook the 3 pieces of pork together, the add 2 tbsp. 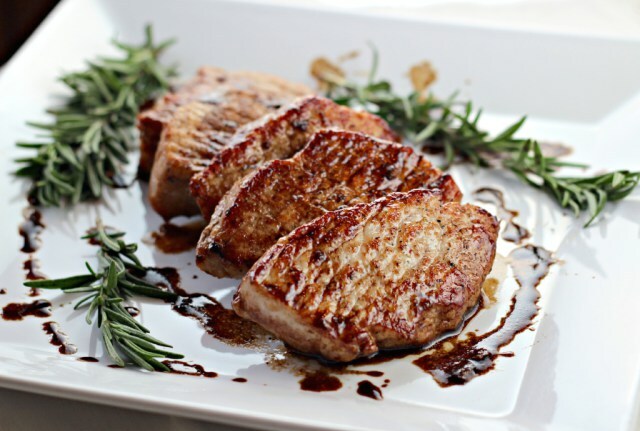 of olive oil per piece of pork you add. While the pork is cooking, in a bowl, combine the cabbage, carrot, green onion, 3 tbsp. of olive oil, 2 tbsp. vinegar, lemon juice and 1 tbsp. of brown sugar, a pinch of salt and pepper and mix it all together. Serve the pork on a bed of the cabbage mix. The soya marinade you reserved can be sprinkled on top. As my grandmother used to say, buon appetito! This looks delicious. I am adding this to my recipes. Thanks for sharing. Also, I am hosting my first fashion link-up today. This looks so yummy, Crissy! I am all about cooking even more this new year. I definitely need to save this recipe. I dont eat meat, but fish, but my hubby would eat this in a second and a nice picture ! This looks delicious! Thanks for sharing at #HomeMattersParty! This looks and sounds fabulous! Oh my gosh. I cannot wait to try this...already pinned it. Thank you, Crissy! I found you through Share the Joy, and so glad that I did.